Masia Can Calet er en familie hus beliggende i centrum af byen Les Franqueses del Valles (35 km fra centrum af Barcelona). Derhjemme finder du ro, komfort, nærhed til dit arbejde eller fritid interessepunkter med en familiær atmosfære. Vores ønske er, at du føler dig hjemme. Vi tilbyder en lejlighed i stueetagen af ​​en gammel gård (Mas) 1840. Lejligheden har selvstændig adgang med en privat udendørs terrasse. Ejendommen har i alt 2.000 meter, hvor vi har privat parkeringsplads, frugthave og haven udenfor. Dets fremragende beliggenhed giver nem og hurtig adgang til de vigtigste punkter af interesse fra erhvervscentre af LES Franqueses og Granollers, Barcelona (30 minutter tog), CIRCUIT SPEED Catalunya (8 km), La Roca Village Outlet shopping (8 km), Mataro BEACH (20 km) eller flere golfbaner (10 minutter). Vi har 2 togstationer med 2 forskellige linjer 10 minutters gang fra hjemmet (30 minutter til centrum Barcelona). En linie har en direkte forbindelse til lufthavnen. When we arrived we nearly thought we were in the wrong place. I was in a normal residential street with apartments blocks surrounding us however behind the huge wooden gate was a little paradise. Daniel and his wife had converted an old farm house into a great place to stay at the edge of the town. We were in the two bedroom ground floor apartment. It had two bedrooms both with their own bathroom, a huge living room and kitchen area, and an enclosed courtyard to share with the other holiday let. We enjoyed it in the morning sun for our breakfast. Daniel was great at giving us ideas of where to visit. We had two days exploring beautiful old villages, one by the beaches near Sa Tuna and one up in the hills near Besalu. Another day we went to Girona which was about 50 minutes by car, and we spent a chilled day at the local beach (20 minutes away) of Marato eating tapas lunch. Daniel also found a running route for my husband which he emailed to us. We loved the cake they left for us on our second day! Thank you to you both for being great hosts. Les propriétaires sont très accueillants,la maison est propre,tout est pratique,l'environnement est calme.Nous avons était très bien installés. Merci beaucoup pour vos gentils commentaires. Nous faisons tout notre possible pour que nos clients profitent de la tranquillité, du confort et du bon emplacement de la propriété. A slice of country - In the city! This was the perfect home for our family of four on a trip to Barcelona. 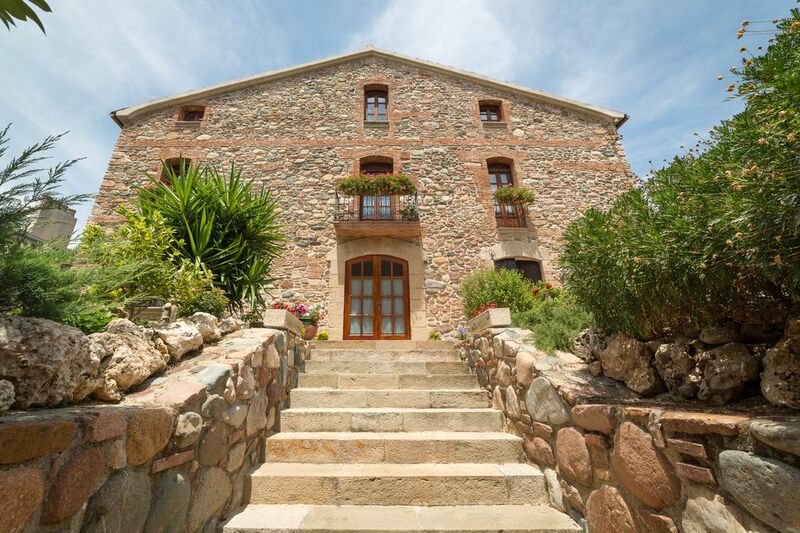 The house itself is an amazing restored farmhouse completed recently and with painstaking attention to detail. It is an open floor plan with high ceilings and a feeling of home. the two bedrooms and two separate bathrooms were spacious and well appointed. The living room is comfortable with a large television and the kitchen equipped with the basics we needed. We also enjoyed the courtyard (former horse stable) for our morning coffee and a place to sit and enjoy the short thunder storm. The house is a large fenced "compound" in the heart of a safe and cheerful residential neighborhood and when we arrived, the whole family said "wow!". The location was also well-situated for exploring being close to two train stations with easy non-transfer service right into downtown Barcelona. The local area has all of the amenities and we had one of our best meals during our month in Spain right down the road at Fonda Europa (thanks for the recommendation Daniel!). Daniel was a great host making our arrival easy and giving us the information we needed to get pointed in the right direction for our exploration of Barcelona and the surrounding area. We will definitely be back! Thank you very much for your kind comments John. We try to do our best to provide a nice stay to our guests (informations, tips or services). Our location and characteristics of the property support this positive experience. We will be glad to receive you and your family at home again. It was a pleasure to share some time with Mathison family !!! Une maison de charme au calme et très bien rénovée , des propriétaires accueillants et un feu de cheminée à notre arrivée ! Nous reviendrons sans hésiter dans ce bel endroit lors de notre prochaine escale à Barcelone. A mi esposo y a mi nos encantó. Es un apartamento muy lindo y tranquilo en una casa de piedra muy bella con jardín interior y todo lo que necesitas para sentirte como en casa. Rentamos un auto y queda a 15-20 min de Barcelona. A una hora te encuentras con pueblos medievales. Daniel el anfitrión es encantador, amable y servicial y te contará todo lo que puedes hacer cerca y te recomendará buenos restaurantes. Seguro volveremos. Muchas gracias Amparo y Ricardo por vuestros amables comentarios. Nuestro objetivo es hacer que os encontreis como en casa y que podáis disfrutar de los muchos encantos que tenemos cerca de nuestra casa (mar, montaña, preciosos pueblos, gastronomia local, etc...). Estaremos encantados de recibiros de nuevo en casa. Gracias por todo. Saludos desde Masia Rincón de piedra BCN!! !